Situated on the waterfront in a greenhouse, Mediamatic FOOD is a restaurant and bar which offers fantastic views of the city. They source their food locally and the ingredients used are absolutely fresh for that delectable taste. 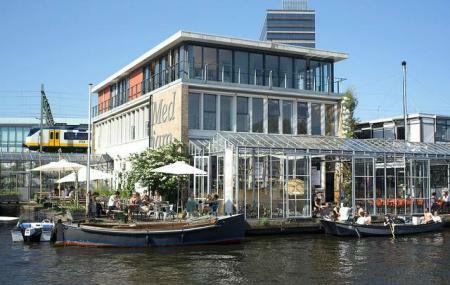 You could visit Mediamatic FOOD for great tasting sessions or for the crafted Amsterdam brew on the sunny terrace. The variety of pizzas here is pretty extensive while they also offer an extensive collection of other food items. Getting to relish lip-smacking food while enjoying the fantastic views is an unrivalled experience and you are sure to love it. People normally also visit Amsterdam Centraal Railway Station while planning their trip to Mediamatic. Mediamatic is such a lovely place in one of the best locations with an amazing view and some of the best plant based food you can get in Amsterdam! They really experiment and create some never seen before dishes that tastes so good! Besides the food they do a lot of cool events and workshops worth checking out and the surrounding urban garden with aquaponics is really cool. Would definitely recommend Mediamatic to anyone visiting Amsterdam. Beautiful location, on the water's edge in a sort of greenhouse. Can be a little chilly in the winter. Pleasant staff. Entirely vegan, except for the mussels. Some of the dishes are experimental, but tasty with interesting presentation. A goid selection of drinks. Worth a visit.